Constance M. Voss, 61 of Ft. Worth, TX, formerly of Marion, KY., died Sunday October 26, 2008 in Ludington, MI. She was born in Hart, Michigan on April 6, 1947 to Charles and Frances (Loree) Easton. She married John "Jack" Voss of Marion, Kentucky and he preceded her in death. Mrs. Voss received her Bachelor's Degree from Ferris State University and was employed by the county of Tarrant, Texas as a bookeeper and also a homemaker. Her interests included quilting, shopping and visiting Disney World in Florida. She also taught quilting classes. Mrs. Voss is survived by her children, Melissa "Izza" Sherfinski of Elizabethtown, KY., Bethany Sherfinski of Ludington, MI, and Charlotte Kiefer of Ludington, MI; step-children, Allison (Doug) Sheperd of Elizabethtown, KY., and Michelle (Steve) Minton of Marion, KY; step grandchildren, Dustin, Cale and Reed; her friend and children's father, James (Glenda) Sherfinski of Harlingen, TX; uncle, Lynn Turley and his family of Ft. Worth, TX. Funeral services will be held Thursday October 30, 2008 at 10:00 AM at Gilbert Funeral Home in Marion, Kentucky with interment in Mapleview Cemetery. Visitation will be Wednesay from 5-9 PM at the funeral home. Memorial contributions may be given to Hospice of Michigan. Condolences may be left online at tatekingfuneralhome.com or www.gilbertfunerals.com. If you haven't visited Dycusburg virtually lately, we welcome you to visit www.dycusburg.com. The site is updated frequently with historical, genealogical and breaking news. Additionally, Dycusburg can be found on MySpace and Facebook. Check it out. 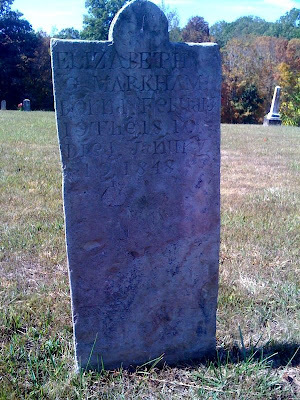 Recently added to dycusburg.com was an interesting account of the Markham family, early settlers of the county. Attendance at Sunday School at Seven Springs was 49, with several more arriving for preaching. We were surprised to read in the newspaper last week that attendance was down at Dycusburg Day. With all of the offerings held throughout the day, including the genealogical meeting at the church and the afternoon gospel singing, no one really took attendance. In fact, in terms of participation from vendors, this last Dycusburg Day was our most successful event ever. Keep an eye on this column for more details about the gazebo and other exciting projects from the Dycusburg Community Group. Congratulations to Chase Matthews and Jennifer Waters who were married on Sunday, Oct. 19 by Judge Exec. Fred Brown at the Henderson cabin on the Cumberland River. It was a gorgeous day. October birthdays to report are Josh Mahns (Oct. 8), Debbie Holsapple (Oct. 26), Marlin Patton (Oct. 28) and Joe Bennett (Oct. 31). 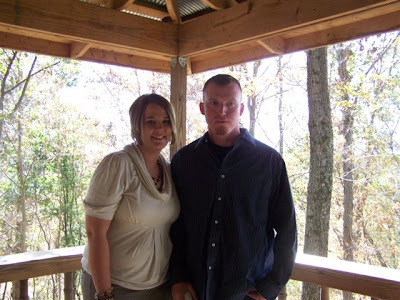 Congratulations to Chase Matthews and Jennifer Waters, married Oct. 19, 2008 in Crittenden County at the Henderson cabin on the Cumberland River. Tombstone of Elizabeth G. Nichols Markham at the Dycusburg Cemetery. Click photo for larger version. The first record we find was in Livington County, Kentucky, on 25 April 1836 he married Elizabeth Nichols. Elizabeth was the wife of Jacob Nichols and we are pretty sure they had at least two children. On 21 April 1841, Permilia I. Nichols Leech married George Washington Hill. She was a daughter of Elizabeth Nichols Markham. In January 1837, George borrowed money on his tobacco crop. George appears with his family on the 1840 census for Livingston County and apparently it is the combined Nichols and Markham family. George is in the 40-50 age group, males. There are three males in the 10-15 age group. We figure they are John R. Markham (1824), William Nichols (1828) and H. Berry Markham (1829). In the 5-10 age group, male, is a person we cannot account for. Elizabeth is in the 30-40 age group, female. In the 15-20 age group, female, are two: Permilia Nichols (1825) and Nancy Markham (1824). There is one female in the 5-10 age group, Sally Markham who was born in 1833. Kentucky Land Grants show that on 14 August 1840, a survey of 127 acres was made for George W. Markham on the Cumberland [River]-Livingston County (book 7, p. 368). Also 28 acres on the Cumberland [River]-Crittenden County (book 19, p. 309). On 27 December 1841, George and Elizabeth sold their farm. I assume this was her farm from Jake Nichols. We found where on 10 June 1841, Elijah Duncan married Nancy Markham, daughter of George W. On 2 February 1846, Patric Smith married Sally Markham, daughter of George W.
Elizabeth Nichols Markham born 19 February 1810, died 19 January 1848 and is buried in Dycusburg Cemetery (KY). We do not believe George W. and Elizabeth had any children. We have not found a marriage record but believe A. Berry Markham, son of George W., and Nancy Bond were married in 1848. On 16 May 1848, George W. married Sarah J. Rhodes, daughter of Aquilla I.
George W. Markham bought some land in Dycusburg on 1 Jan. 1849. Bond was signed by his son, John R. Markham. Federal census for 1850 shows Elijah Duncan and Nancy in Crittenden County with their family. George W. is head of a household in which are living John R. and his wife, Margaret. Crittenden County marriage records show that on 23 Aug. 1850, John R. Markham married Margaret A. Crow. We did not find A. Berry Markham and Nancy nor Patric Smith and Sally in 1850. Have no idea what happened to Sarah Rhodes whom George married on 16 May 1848. Did not find any divorce or annulment records. Crittenden County census for 1850 shows households #243-343 of Washington Hill and his wife Permelia and their family. Living with them is William Nichols age 22. Permelia and William are step-children of George W. and apparently were in his household in 1840. Princeton, county seat of Caldwell County, marriage records show that on 17 Nov. 1851, George W. married Mrs. Nancy Wells. Elijah Duncan signed the marriage bond. George and nancy are on the census for 1860 in Crittenden County, KY. Children were Mary 7, Lucille 6 and Sarah A. 2. We didn't make any real effort but did not find Nancy's children James and Jasper. On 27 March 1861 George and nancy sold some of their land. We don't know for sure how many children George and Nancy had but there were twins, born on 27 March 1862, George Marion and Helen (Tilton). One of George W. and Nancy's daughters, Lucille married Elihu Noah Duncan and on 21 Oct. 1878, George W. signed an indenture leaving his farm to Elihu and Lucille on the condition they take care of him for the rest of his life. Federal census 1880 for Crittenden County lists Nancy Markham, widowed, and living with her is her son George. Found nothing on Nancy Well's children and the only other child of George W. and Nancy we found was Lucille who had married E.N. Duncan. George W. was probably dead by 1880 but we don't know the date, place of death, nor burial place. Nancy died 28 April 1881 and is buried in the Dycusburg Cemetery. She was born 27 July 1825 in Virginia. Buried near Nancy is Lucille F., wife of E.N. Duncan, born 11 March 1854 and died 22 April 1909. Next to her is Elihu Noah Duncan, her husband, born 1845 and died 1919. There was a William Markham in Livington County in 1840 living fairly close to George W. William was in the 30-40 age group and could have been a brother of George W.
We found a James Markham in Scott County who was in the 20-30 age group and his wife was in the same age group in the 1840 census. On 1850 census for Crittenden County is a James Markham with his wife, Elizabeth, living fairly close to George. We believe this is the same James found in 1840 in Scott County. James is shown as age 32 and his wife is 31. Two children ages 9 and 5 are shown as born in Missouri. One child age 3 and the other 4 months are shown born in Kentucky. This would indicate that after 1845 they moved from Missouri to Kentucky. James is shown as born in Kentucky. Kentucky birth records show a son born to James Markham (born in Kentucky) and Elizabeth Thompson Markham (born in Missouri) in Crittenden County, Kentucky on 9 Aug. 1852. No doubt this was Lewis M.
Sometime before 1860 James was gone from his family. We found where on 19 Oct. 1857 a James L. Markham married in Crittenden County to Miss Martha Seeper. This could be Elizabeth's husband but we have no further information. When we first started working on this Markham family, it was our good fortune to contact Annie Markham Mabry. She is a great-granddaughter of George W. but she had no information on him. Annie kept talking of Berry's brother George M. who went to California and became wealthy. She had a copy of George M.'s will which she gave us. In this will he refers to his half-brother, James Wells, Nancy's son and his half-brother John Markham and two of John's children, was a brother of A. Berry Markham. From this will we got enough information to write to California and got a death certificate on George M. which shows he was born in Kentucky. George W. was a father and Nancy Kelly his mother. Annie also told us her grandfather Berry had raised a cousin Tennessee (Margaret). Margaret was the daughter of James and Elizabeth Thompson Markham. For some time we had figured that Berry and James were brothers but ages do not fit so we are assuming James was a brother of George W. Records show us George W. was born in Virginia and James was born in Kentucky. So, if our assumptions are true, and what Annie says is true, then the two were brothers and sometime between 1805 and 1818, their parents left Virginia and moved to Kentucky. Note #1: We have divorce papers on George W. from Sarah Rhodes. Note #2: Found marriage record of Hiram Wells and Nancy Kelley in St. Francois County, Missouri, 2 June 1843. There is no positive proof, but there is a family in Wayne County, Kentucky who mostly spell their name Marcum. Head of one of the families was Archibald and we have records that list his children. Among them are a George (not George W.) and a James M. Census records and tax lists both indiciate this could be our George. Indicated age, number of children and years of appearance on tax lsits all fit. As to James M. he appears variously as James and James M.
We were surprised to read in "Dycusburg and Beyond" in this week's issue of The Crittenden Press that attendance was smaller at this year's Dycusburg Day event. Actually, throughout the day several events were held and many people came and went throughout the day. I wonder if the columnist who wrote that perhaps was comparing the event to the July 4 "Red, White and Boom" event where the Dycusburg Area Veteran's Memorial marker was installed or perhaps comparing it to the Chase Matthews homecoming day (an event separate from Dycusburg Day). We also noted that the columnist did not even attend the event, so we are not sure where the information came from! This year's Dycusburg Day was fantastic! So many people enjoyed the family-like atmosphere, and we were so proud to see many of you there. The Dycusburg Community Group is pressing on with many future projects! Stay tuned for our future plans! This marker was placed at the entrance of Dycusburg Cemetery a few weeks ago. Click on image for larger version. Dycusburg Day was held on Saturday, Oct. 11, with quite a few in attendance. A silent auction and several raffles were held throughout the day, while Jeannie Griffin and Michelle Henderson grilled. The Dycusburg Baptist Church passed out free water and tracts. Carol Strilko of New Lenox, IL, had an impressive display of Avon products. At noon, a parade went through town three times, with sirens blaring from fire trucks and the sheriff's vehicle while candy was thrown to people along the streets. Children enjoyed playing on the inflatables throughout the day, and also were mesmerized by the magician, Tommy Rushing. In the afternoon, "Living Proof" performed a gospel singing. A Little Miss and Master Dycusburg contest was held, and Dylan Strilko (son of Tom and Becky Strilko of New Lenox, IL) and Aliyah Frutiger (daughter of Jenny Patton) took home a trophy and $50 savings bonds. The Crittenden County Genealogical Society held the second half of its meeting at the Dycusburg Methodist Church where Matthew T. Patton gave a brief talk on the history of Dycusburg. After the talk, the group headed to the Dycusburg Veteran's Memorial Park site where the old city hall once stood. The next stop was the Dycusburg Cemetery to look at interesting graves throughout the graveyard. It was a neat sight to see so many people in the cemetery at one time walking around and looking at the graves. A number of graves are in need of repair at the cemetery, and the group also noticed a peculiar moss on many of the stones. At 6 p.m., the group "Gunner T" came back to rock the town. Several sat on lawnchairs and haybales to enjoy their music, while many danced in the streets. 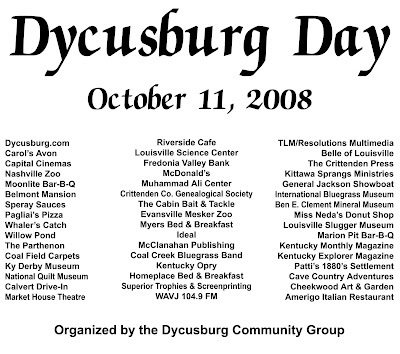 The Dycusburg Community Group would like to thank all of the numerous sponsors who helped make the day a success. Several attended Sunday School at Seven Springs, with more arriving for preaching. Gary Dycus and Renata Smotts of Cameron, TX drove an RV up to Dycusburg, arriving on Friday. Gary is studying his ancestry, found dycusburg.com and decided to motor the more than 800 miles to partake in Dycusburg Day. Share your birthdays, celebrations and other news by e-mailing dycusburg@yahoo.com. Join Us for Dycusburg Day 2008: Rolling on the River! Fabulous Door Prizes – Must register to win. Fun and Games for Children (10 – noon), including Duck Pond, Go Fish, Bean Bag Toss, Lollipop Tree, Chicken Toss and Dice Roll. Inflatables for Children (all day long). 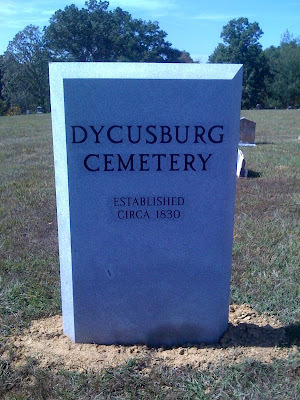 Crittenden County Genealogical Society meeting: “History of Dycusburg” at Dycusburg Methodist Church, followed by a walking tour of the Dycusburg Cemetery (11 a.m. – 1 p.m.). Parade at noon with unique and antique cars. Magician Tommy Rushing (1 p.m. – 2 p.m. and 3 p.m. – 4 p.m.). Afternoon Gospel Singing by “Living Proof” (2 p.m. – 3 p.m.). Live Music by “Gunner T” (starting at 6 p.m.). Silent Auction (2 p.m. to 8 p.m.) and Raffle (all day) ... A great selection of items including gift certificates, getaway and restaurant packages, autographed books, food items and movie tickets (complete list at www.dycusburg.com/dcg after September 20). Live Broadcast by WAVJ 104.9 (starting at 10 a.m. – noon). DYCUSBURG, Ky. — Services for Teddie Lynn Davenport, 56, of Dycusburg will be at 1 p.m. Friday at Dunn’s Funeral Home in Eddyville with the Rev. Lonnie Knight officiating. Burial will be at Dycusburg Cemetery. Mr. Davenport died at 5 p.m. Tuesday at Vanderbilt University Hospital in Nashville, Tenn. He was injured in a wreck Friday on Ky. 295 at the Crittenden-Lyon county line. He was a member of Dycusburg Methodist Church. Surviving are two brothers, Denny Davenport of Kuttawa and Thomas L. Davenport of Dycusburg; two sisters, Debbie Davenport of Kuttawa and Donna Walker of Navarre, Fla.; and several nieces and nephews. His parents were Lawrence and Robbie E. Davenport. Friends may call from 5 until 8 p.m. today at the funeral home. At the time of this writing, Teddie Davenport, 56, of Dycusburg remains hospitalized at Vanderbilt in Nashville. He suffered serious injuries on Friday when he had a heart attack at the wheel of his vehicle, losing control and exiting the roadway at the Crittenden-Lyon county line on Hwy. 295. He was ejected from the driver's side window. Several emergency personnel responded and he was air lifted to Western Baptist Hospital in Paducah and later transferred to Nashville. His family extends thanks to everyone for their prayers during this time of need. Imogene (Davenport) Peters, now resident of Hilltop Nursing Home at Kuttawa, wanted to thank everyone at the Dycusburg church for building the ramp up to her front porch. Jenny Patton, Amber Sullivan and Joni Stuessel enjoyed going to Paducah for BBQ on the River on Friday. Michelle Henderson is enjoying her visit with her granddaughter from Houston. Lavinia McGinnis is spending two weeks visiting with her family. Saturday afternoon, Aliyah Frutiger had a play date with her cousins Makanda Rolfe and Lavinia McGinnis. Attendance at Sunday school at Seven Springs was 56 with several more arriving for preaching. Weekend visitors of Lonnie and Joy Knight were Randy, Andy and Sarah Knight of Marion, Ill.
A cookout and hay ride will be Sat., Oct. 4 at Seven Springs, starting at 3. Everyone is invited. The next meeting of the Dycusburg Community Group will be Thursday, Oct. 2 at 7 p.m. at the home of Michelle Henderson. Anyone interested in the advancement of the community is encouraged to attend. We are constantly seeking new members with fresh ideas, so come on out! Refreshments will be served. The silent auction at Dycusburg Day (Oct. 11) has some fabulous items worth checking out, including a movie lover's package, restaurant gift certificates, a baby clothes set, autographed books, magazine subscriptions, CDs and more. Several items will also be raffled. We will publish the full list of silent auction and raffle items at www.dycusburg.com/dcg soon. Just by attending, you can enter for some free door prizes, including a food gift basket and a $50 gift certificate to Patti's Restaurant. A Little Miss and Little Master contest has been added to the lineup of Dycusburg Day. Interested applicants can find entry forms at www.dycusburg.com/dcg or at the Dycusburg Grocery. Entry fee is $15, payable to Dycusburg Community Group. Each of the winners will receive a certificate, trophy and a $50 savings bond, courtesy of Fredonia Valley Bank. Congratulations to Jake and Jody Selph on their two year anniversary (Oct. 14). Have a funky, fun or historic car or truck (or piece of farm equipment) to enter into the Dycusburg Day parade? Call Michelle Henderson at 988-2758 or e-mail dycusburg@yahoo.com for details. 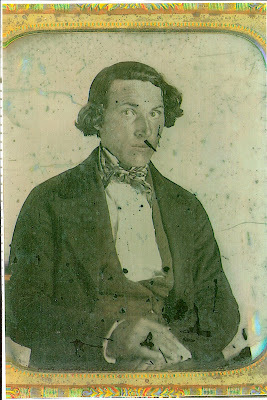 Pictured is John Logan O'Brien, Jr. (1833-1884), son of John Logan O'Brien, Sr., and Remica Shoemaker, taken as a young man prior to his marriage to Sarah McElroy, born abt. 1842 in Caldwell Co., KY or Crittenden Co., KY, the daughter of Isaac Benjamin McElroy and Celia Crouch (Source: 1860 KY Census, Crittenden Co., Dycusburg P.O.). They married December 19, 1860 in Crittenden Co., KY (Source: Marriage Record). Click for larger version. If you have any additional information about the O'Brien or McElroy family, please e-mail matthewtpatton@yahoo.com.